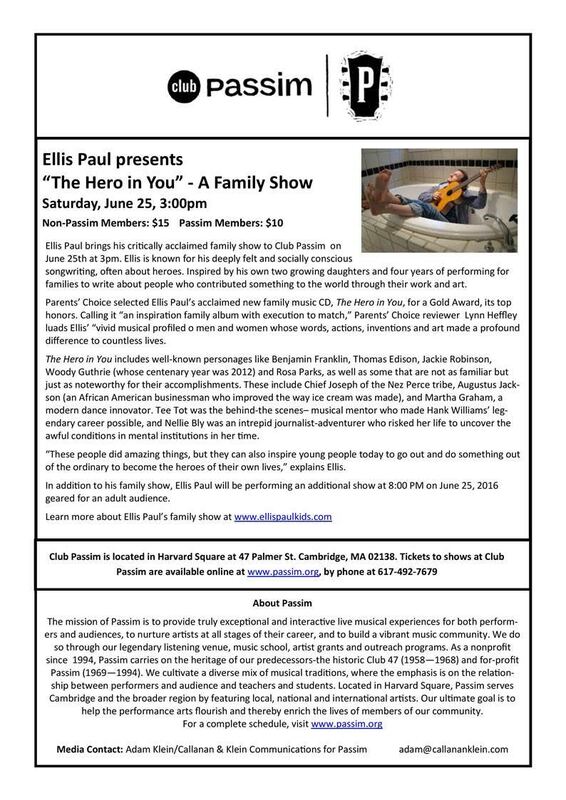 Ellis Paul is returning to Club Passim on June 25th for a family show. Ellis will present The Hero In You that includes well-known personages like Benjamin Franklin, Thomas Edison, Jackie Robinson, Woody Guthrie (whose centenary year was 2012) and Rosa Parks, as well as some that are not as familiar but just as noteworthy for their accomplishments. Ellis is known for his deeply felt and socially conscious songwriting, often about heroes. Inspired by his own two growing daughters and four years of performing for families to write about people who contributed something to the world through their work and art. Ellis Paul will also be doing an additional evening show geared more towards adults.